If you are not sure what this yoga thing is all about, we recommend you try our fundamentals class. 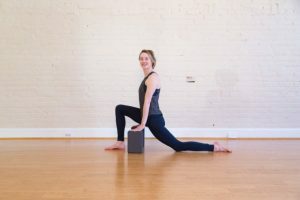 You will get plenty of opportunities to move and challenge yourself, but there will be extra time to learn as the teacher breaks down the poses. The class will include many demonstrations and modifications. You will learn the terminology needed to take a vinyasa class as well as proper alignment so you do not injure yourself! We currently offer this class on Saturdays at 11:45 AM-12:45 PM. This is also a great complement to your beginner series! If you are enrolled in the 4- Week Beginner Series, this class is a wonderful way to get some extra practice. When do take the beginner yoga series for the first time, you also receive a 30 Day unlimited class package, so you can take this class at no extra charge. We also recommend the fundamentals class for those who have taken time off from their practice or have had an injury. Going back to basics is always a good thing. Refresh Yoga Center offers beginner and advanced yoga on King Street. It’s a convenient location for those in Old Town Alexandria, Arlington, Belle Haven, Fort Washington, and National Harbor. For those who live in DC but work in Virginia, try waiting out the traffic in one of our weeknight classes!